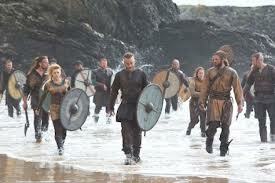 Episode 1 of ‘VIKINGS’ will be aired on US television on 3rd March 2013. As part of my work as the cast Dialogue Coach I have been involved in constructing our ‘Viking’ accent and helping the Actors fine tune their Old Norse and Anglo Saxon sounds! I’ve also had a sneak preview of some of the episodes, and wow it is stunning. Great cast, great story, action packed and looks amazing. I’m so proud to be part of such a fantastic crew. Shot 100% in Ireland, with a budget in excess of €20 million, it’s a much needed boost to the economy and the Irish film industry. Cast includes: Travis Fimmel, Clive Standen, Gabriel Byrne, Katheryn Winnick, Jessalyn Gilsig, Gustav Skarsgard, George Blagden, Thorbjorn Harr, Alyssa Sutherland, Donal Logue, Jefferson Hall, David Pearse, John Kavanagh, Tadgh Murphy and over a hundred talented others! For a look at the first teaser trailer released only last week – click here.